A SpaceX Falcon 9 rocket launches the U.S. Air Force's X-37B space plane on Sept. 7, 2017. The U.S. Air Force's secretive X-37B space plane has apparently been spotted by satellite watchers. The craft's latest mystery mission, known as OTV-5 (short for Orbital Test Vehicle-5), began on Sept. 7, 2017, when the robotic spacecraft launched atop a SpaceX Falcon 9 rocket from NASA's Kennedy Space Center (KSC) in Florida. Skywatcher Cees Bassa from the Netherlands reported a chance sighting of a bright satellite of unknown identity, observed early on April 11. He estimated a circular orbit of about 54.5 degrees inclination and 220 miles (355 kilometers) altitude. Bassa alerted the global satellite-observing network and others that this could be OTV-5. Another satellite spotter — Russell Eberst in Edinburgh, Scotland — had reported seeing a satellite of similar brightness and orbit last October. "I produced rough search elements that proved too rough to recover the object," said Ted Molczan, a Toronto-based satellite analyst. "I found, with very slight tweaks, the preliminary orbit that Cees had posted could be made to fit both his and Russell's observations," Molczan told Inside Outer Space. Bassa noted that this object's orbit correlates well with the OTV-5. The orbit passes very close — within 2 degrees of longitude — from KSC at the time of liftoff. Meanwhile, another satellite tracker, Marco Langbroek, also in the Netherlands, noted that the U.S. Air Force had earlier announced that the OTV-5 would have the highest inclination of the series of missions to date. "Looks like a pretty probable identification," Langbroek reported. Molczan is more certain. "Cees recovered the object, which can now be identified beyond reasonable doubt as OTV-5," he said. "As Cees cautions, further tracking may reveal a bit more eccentric orbit, but the mean altitude is about 355 kilometers, and the inclination is close to 54.5 degrees. "I estimate that the ground track nearly repeats at intervals of about 31 revolutions, or about two days," Molczan added. "Similar behavior has been seen during portions of all previous OTV missions. If it carries an imaging payload, then the orbit affords frequent revisit of targets, but it could serve some other operational purpose that I cannot guess." When OTV-5 will return to Earth is anybody's guess. The X-37B program completed its fourth mission on May 7, 2017, landing after 718 days in orbit and extending the program's total number of days spent in orbit to 2,085. The Air Force Rapid Capabilities Office is running the X-37B Orbital Test Vehicle program. "The fifth OTV mission continues to advance the X-37B's performance and flexibility as a space technology demonstrator and host platform for experimental payloads," Air Force officials said in a prelaunch statement. 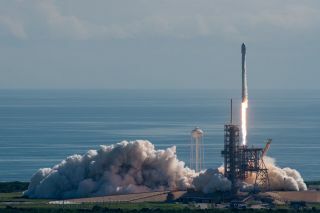 "This mission carries small satellite ride shares and will demonstrate greater opportunities for rapid space access and on-orbit testing of emerging space technologies." The current mission is hosting the Air Force Research Laboratory Advanced Structurally Embedded Thermal Spreader payload to test experimental electronics and oscillating heat pipe technologies in the long-duration space environment. "The many firsts on this mission make the upcoming OTV launch a milestone for the program," Randy Walden, director of the Air Force Rapid Capabilities Office, said in the statement. "It is our goal to continue advancing the X-37B OTV so it can more fully support the growing space community."